MINISTER FOR JUSTICE Frances Fitzgerald has announced the details of the recruitment of a further 250 new gardaí by the end of the year. Speaking at the annual conference of the Association of Garda Sergeants and Inspectors (AGSI) in Meath this morning, she confirmed two new batches of 125 recruits will enter garda college at Templemore. The ‘ramping up’ of recruitment will begin “over the coming months”, she said. I promised seamless ongoing recruitment and I am delivering on this promise. The additional recruitment will bring the total number of new recruits since September last year to 550, and “signifies the determination of Government and I to delivering an effective, responsive police service to protect our communities and respond to emerging crime trends,” the Minister said. She added that plans to address IT issues within the force, such as those with the Pulse computer system. A report on the exact needs of scale of investment required is due shortly. It was flagged earlier this year that there are no plans to replace Pulse, in spite of comments recently by the head of the Garda Inspectorate that it should be scrapped. 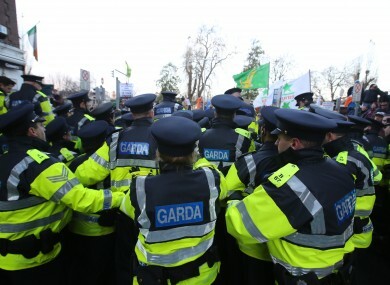 Approximately 20,000 people applied for positions in An Garda Síochána when its recruitment campaign began in December 2013. It was the first garda recruitment drive since 2009. Representative bodies have been calling for recruitment for years, with almost 300 retirements from the force in 2013 alone. The move was welcomed by the Immigrant Council of Ireland which today asked the force to make an effort to encourage applications from people of a migrant background. Published at 9.58am. Additional reporting by Nicky Ryan. Email “'Ramping up': 250 new gardaí will be recruited this year”. Feedback on “'Ramping up': 250 new gardaí will be recruited this year”.